With rising multipliers, free spins and the chance to win several times over on a single bet, Jungle Jim – El Dorado is shaping up as one of most popular Microgaming slot releases of 2016. Play it now for real cash at Jackpot City Casino, or keep reading to find more about this featured-loaded slot game. Thus, the minimum bet is $0.25 (one $0.01 coin per line) and the maximum is $25 (10 x $0.10 coins per line). While that betting range might not satisfy the high rollers, it should be enough for the average punter who doesn’t possess an infinite amount of wealth. Rolling Reels – Patented by Microgaming, the Rolling Reels feature gives players the chance to put together multiple consecutive wins on a single spin. Winning symbols explode and vanish before new ones slide down to fill in the blanks, much like when you complete a line in a game of Tetris. It’s the same concept as NetEnt’s Avalanche Reels and Betsoft’s Cascading Reels. Multiplier Trail – The Jungle Jim online slot also features a multiplier which rises with each consecutive win via Rolling Reels. 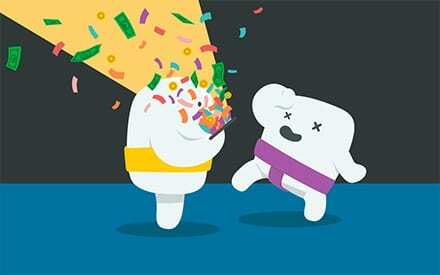 Payouts are doubled for wins on the first ‘roll’ (i.e. if you win again after the first symbol explosion), tripled for the second, quadrupled for the third and multiplied by five on the fourth roll. Free Spins Bonus – Three scatter symbols activates 10 free spins that can be retriggered at any time during the bonus game. All wins are tripled, as is the value of the rising multiplier. Thus, the first roll pays 6x wins, the second pays 9x, the third pays 12x and the fourth gets a huge 15x multiplier. 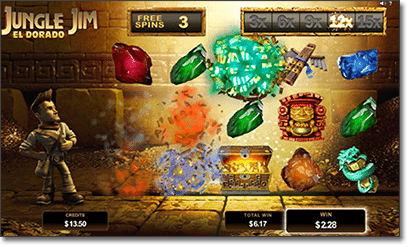 Jungle Jim offers an in-game jackpot of up to 920,000 coins. There are eight standard symbols, ranging from gem stones to Aztec-inspired totems to chests brimming with gold. The game also features a Jungle Jim wild that substitutes for everything except the scatter, which wins from anywhere on the reels and pays according to the total amount wagered. 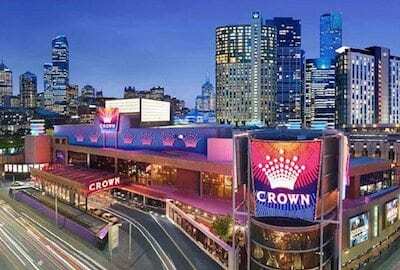 While Microgaming has been plotting a promising way forward behind the scenes, many of its recent slot releases have left something to be desired. Although Jungle Jim El Dorado is an improvement, offering quality graphics and some opportunities to win big, it is hardly the most innovative game on the market. Remember how we said earlier that Microgaming’s Rolling Reels were much like the equivalent features found in Net Entertainment and Betsoft slots? Well, you can say the same for just about every other aspect of Jungle Jim El Dorado. 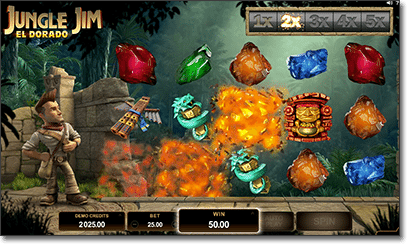 From the Aztec relics to the exploding symbols to the rising multipliers, it plays almost exactly like Rook’s Revenge – a popular Betsoft title which is itself heavily influenced by Gonzo’s Quest. Is that a bad thing? Not necessarily. Both Gonzo’s Quest and Rook’s Revenge are renowned for offering frequent payouts and the chance to strike big winners through multipliers and free spins, and that’s pretty much what the Jungle Jim El Dorado slot game delivers too. The lack of betting options is a disappointment – a top coin size of $0.10 is bordering on silly in this day and age. One might also say the scatter feature pays a bit light compared to other real money slots online, especially as it only appears on the first three reels. Those are minor grievances in the grand scheme, however, and there’s nothing to fault about the gameplay or performance. If you’re happy with a $25 max bet and want a medium-variance pokie with excellent audio-visuals and some fun features, Jungle Jim is as good a bet as any. The Jungle Jim El Dorado online slot game is available now at our top Microgaming casinos for online players. Readers of RealMoneyCasinoSite.com can score free cash, free spins and more exclusive welcome bonuses by visiting any of the links in our casino table at the top of this page and signing up for an account.